In the past I have been reluctant to do artwork because I want the finished product to be really good…something that I can be proud of, but I am starting to enjoy the actual process more. That is a good thing since I will never reach the point where I am happy with my work unless I practice. It is so easy for me to be drawn in to sewing projects because I do so much of it and my sewing tools and space are always set up, but I will be trying to give equal time to art projects that don’t involve sewing. A few nights ago I gathered up my colored pencils that I bought decades ago. I found them in various trays and boxes throughout the house. They have been used by my kids to color many geography maps, charts of the human body, and to color in pictures that they asked me to draw for them. Well, I decided that I needed to treat myself to a new set, and I did.They are beautiful and drawing is a lot more fun without the huge gaps in the color spectrum. This drawing includes a doll dress that I bought from a fellow sew-person in town who has the best yard sales you can imagine. I love seeing her and what she has rounded up to sell, and what sewing projects she is working on. 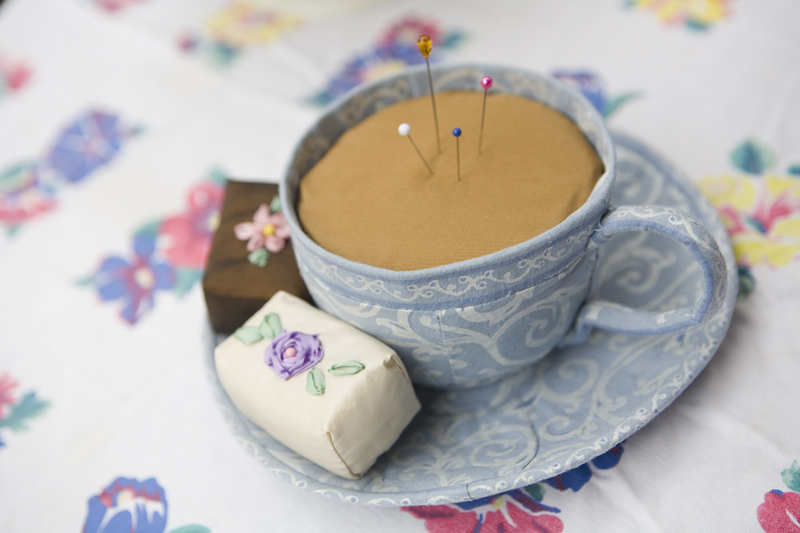 The chenille pin cushion was made by another local sewing artist. Don’t stand there, stand here. Due to the cottage like size of our house, I always have to move furniture around to make room for the Christmas tree, and that always puts me in the mood to rearrange everything right after I put all the decorations away. My awesome antique dress form was hidden behind a shelf in a room that had way too much furniture in it. So after doing some more rearranging, and selling a cute but large armoire, she now has a roomier place to stand. I feel bad enough that she can’t sit once in awhile. I thought this would be the perfect outfit for my Acme Adjustable Collapsible Ellanam dress form. On the label it says L and M Co. in parenthesis. I should call her Ellan or maybe Auntie Am. I haven’t done any painting in a while because my teacher is having surgery on her foot and I’ve been kind of busy. I have made a commitment to myself, though, to do more artwork and started with a colored pencil drawing last night. I am amazed at how practicing in one medium with a good teacher carries over into other forms. I could really tell a difference in the drawing process. I will post at least a section of my drawing later.